Physical album chart is based on aggregate data from Gaon and Oricon and is only available for albums released in 2018. According to the latest update from Gaon and Oricon, top 10 Kpop girl groups have the highest album sales in 2018 has come out. 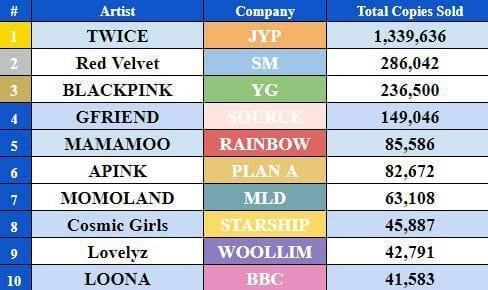 No wonder the “top Asian girl group” TWICE topped the chart with 1,339,636 albums being distributed in the first eight months of 2018, accounting for 56.5%. The JYP girls have worked hard in both the Korean and Japanese markets and have consistently hit the charts, dominating both physical and digital. Their song “What Is Love?”, “Dance The Night Away” were released in Korea or “Candy Pop – BDZ Album” in Japan also helped them to prove their title as the most powerful female group in Kpop industry. With the release of their mini-album “Summer Magic” on August 6, 2018, the girls from SM Entertainment – Red Velvet have come up with the second place, with 286,042 albums sold, making up 12.1%. 2018 physical releases of girl groups. The global hit “DDU-DU-DDU-DU” came in at No. 3 on the chart, with 236,500 albums sold at 10%. Thus, the top three positions were all the artists from “BIG 3”. The remaining seven are also names that are no stranger to netizens: next was GFRIEND with 6.3%, MAMAMOO 3.6%, APINK 3.5%, MOMOLAND 2.7%, Cosmic Girls 1.9%, Lovelyz 1.8%. Notably, the rookie group LOONA also appeared at No.10 in the chart with 41,583 albums sold.